Your racism is showing, Arizona. 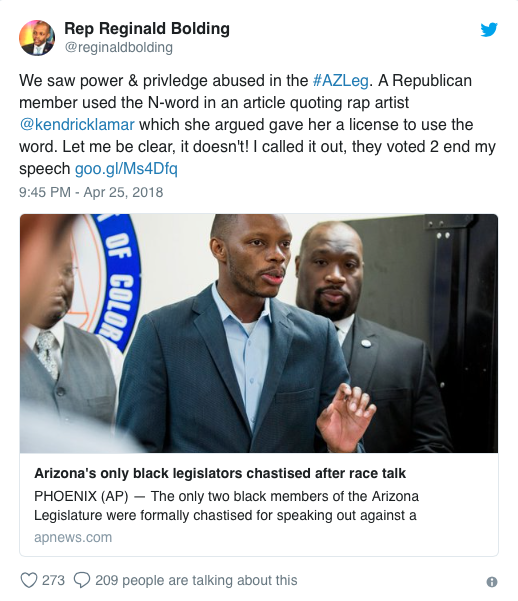 Unsurprisingly, Arizona's only two black state legislators were publicly reprimanded shortly after they expressed concern over a colleague using the N-word in a recently published article. The article, published this past Wednesday, has been updated without use of the "offensive term." That is the least they could do. State Rep. Maria Syms, a Republican, wrote and published the piece in which she discusses her views on the recent teacher protests and walkouts in Arkansas; as well as her criticism of #RedForEd leader Noah Karvelis, who she claims "grooms young children with liberal ideas." In the article, Syms includes lyrics from Kendrick Lamar's Grammy award-winning, Black Lives Matter inspired Alright, but chose not to leave out the n-word. She figured that incorporating the lyric gave her "license to use the word." Rep. Syms wrote, "He prides himself on teaching the hip hop music of Kendrick Lamar (whose lyrics include 'We hate Popo [police], wanna kill us dead in the street for sure...') to 10-year-olds, indoctrinating them in 'social movements and societal change' and 'socioeconomic and racial privilege." Later that day, one of only two Democratic state representatives, Rep. Reginald Bolding delivered a floor speech criticizing the article. He said Syms, who is white, should not be using the word in public discourse even if it is part of a lyric or quote, reported CNN. "I want to make it crystal clear today that it is not acceptable to use these words in print or aloud about African-Americans, especially not by elected officials. As representatives of this great state of Arizona, we are held to a higher standard," Bolding asserted. He was joined on the floor by fellow Democratic Rep. Geraldine Peten, who stood in agreement and chimed in with Bolding's statements. To no one's surprise, their comments were interrupted by a fellow legislator, who said Bolding and Peten were "out of order" and violating House Rule 19. The legislator claimed Syms was "impugned" because she was "accused of using a racial slur." In agreement, House Speaker J.D. Mesnard--also a Republican--chastised Bolding saying, "I don't know why it's so hard to follow the rules. "It doesn't matter whether you are white or black or brown or whatever the color of your skin is, you follow the House rules." The Republican representatives proceeded to vote to formally rebuke the pair. Bolding refers to the session as "an abuse of power." Rep. Bolding also took to Twitter to air his concerns. "We saw power & privledge abused in the #AZLeg. A Republican member used the N-word in an article quoting rap artist @kendricklamar which she argued gave her a license to use the word. Let me be clear, it doesn't! I called it out, they voted 2 end my speech," he tweeted. CNN is awaiting responses from both Mesnard and Bolding.